Heat the oil in a large saucepan over medium heat. Add the sausage and cook, stirring frequently, for 4–5 minutes or until golden brown and crisp. Remove and set aside. Add the garlic and celery to the pan and cook, stirring, for 1–2 minutes or until golden. Add the stock and water and bring to the boil. Add the pasta and cook for 5 minutes or until almost cooked. 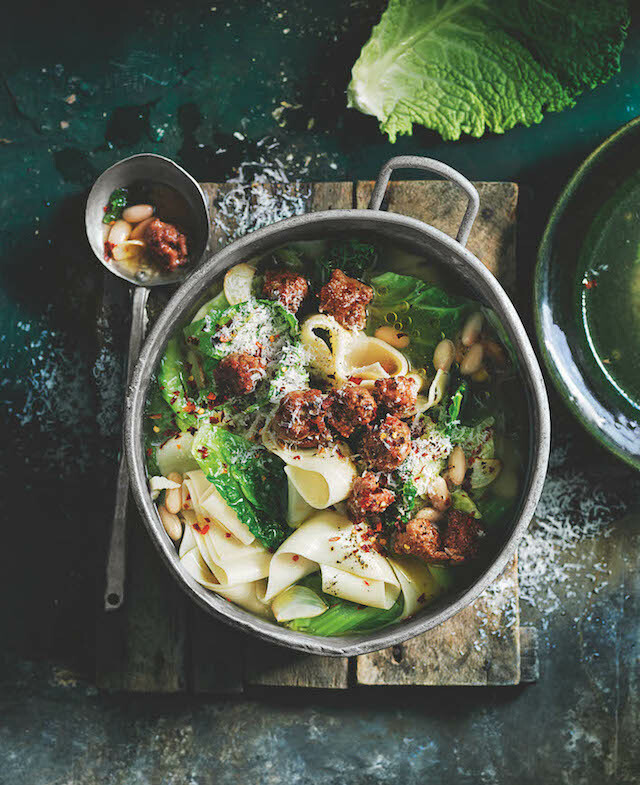 Add the cabbage, beans and sausage and cook for 2–3 minutes or until cooked through. Divide the soup among bowls, top with pecorino, chilli and pepper, and drizzle with oil to serve.